Here's a confession: I've never joined NaNo or its official branch-outs. This July, I tried Camp NaNo out, and finished in 14 days! Sparse draft: a draft composed mainly of dialogue and character interactions, with minimal description or words in general. Often includes excessive square brackets indicating changes to be made. This draft is only about 40K compared to a projected 90K of the final draft. Basically I spilled ink all over the virtual page. So basically, the first upside is that I'm free-wrote really really quickly. If I know a scene needs to exist but it's not in my head, I leave a note in square brackets and move on. If I can't figure out the chinks in this scene, I leave a note in square brackets and move on. If I don't know what I'm doing, I leave a note ... yeah, you get the idea. It'll also get rid of all the fluff and pretty metaphors that I'm rather fond of. I'm not saying I'll leave them out if they come to mind, but I'll do my utmost not to dwell on style at all. Sentence fragments, square brackets, even script-type dialogue — it doesn't matter. My job isn't even to get the words down, it's just to get the ideas down. These are mainly things I've judged unimportant until I have the approximate novel down — I might not reintroduce them until I finish the second draft. A sparse draft stopped me missing the forest for the trees, and we can hammer it out from the panorama to the pixel. My progress at myWriteClub. Find me at alyssacarlier! and what's really frightening is that it's smack in the middle of a "dead" genre: YA dystopian. You could see me plan in my #WatchMeWrite, and stay tuned for up-close looks at excerpts this Saturday and in July's #WatchMeWrite. And stay updated on my process by reading monthly letters from me to you! Thoughts on my process? On my novel idea? The comments are yours! First of all, a big congratulations to you, Alyssa! 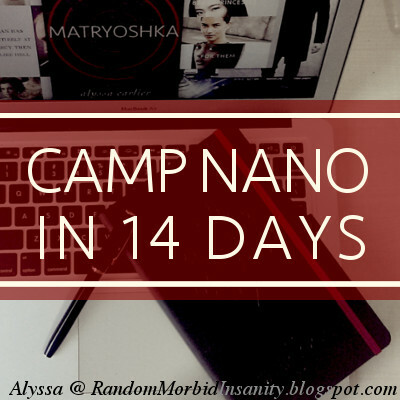 *showers you with confetti and cake* I'm still plugging away at my Camp NaNo novel right now. I went much faster last Camp NaNo, but I'm still happy with my pace. I think this is an interesting way of drafting. I'm not sure if it would work for me, but I think it's a great idea to just get the bare bones of a story down before editing so that you have something that you can really work with. I love to plot out my stories beforehand, which also leads to me having a preference towards trying to get as much in the first draft as I can. Otherwise, I just end up with an overwhelming mess that makes revision much scarier. However, when it comes to revising, I definitely break it down into steps and focus on one aspect for each readthrough. Still, I just might try this bare bones drafting technique someday. Thanks for sharing your secrets! Also, Matryoshka sounds awesome. Thank you, Ana! 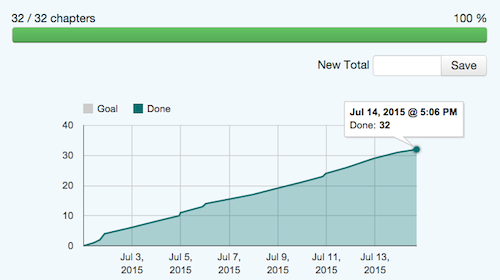 *twirls in confetti and eats cake* You're making amazing progress on myWriteClub, so keep going! *waves pom-poms* Mmm, yes, at one point I just got tired of writing so many words I would delete so I devised this method. I can definitely see where you're coming from when you try to include more in the first draft -- revisions does feel scary when I'm looking at this hot steaming mess. Readthroughs are definitely the way to go for revisions. And thank you for your kind words! I like this! You've really thought this through to see what works best for you. I'm kind of the opposite. I do nothing sparse. Anything and everything that I'm thinking goes on the page. Whatever I'm trying to say, I might say it three different ways because I'm not sure how to go about it. I draft big and than pull out the drivel later. That way everything is there. I do that the brackets, note-to-self thing a lot too. If I know my dialogue/internal thought is not worded true to the character, I'll make a note. "Not the way Oddball would say it, reword." Or something like that. If I know I've got to much description, I'll make a note, "Pick one/cut down." I try not to stop and edit. That used to be my biggest downfall during the first draft process. Thank you, Ashley! I do leave notes here and there when random ideas come to my head, and when I tried out Write to Die I literally just repeated the same idea just to stop the red light and the beeping, ahaha. I don't write scenes out of order, but I do make notes on major elements of what a future scene has. *squints suspiciously* THAT is sparse drafting? That is long. I've been learning that if I don't start sparsely I never really finish my drafts... So my last few novels have all started out at like, 15,000 words. 40,000 words seems huge, comparatively! But I am hung up on semantics here when the point is that you have conquered your goals, so congrats and top hats and baseball bats, etcetera. Although, you didn't say outright—do you feel like the sparse drafting helped, and you're willing to do it again? If so, I hope the tactic continues to be profitable for you! Also, Matryoshka sounds interesting and reminds me of mothers. That is all. I used to OVER-write, you know? For a novel that ended up 100K, its first draft was 140K long. So underwriting is such a new experience, although you clearly take it to a new and wonderful extreme. Thank you, although I'm certain baseball is too American. Oooh, I see. That's kind of insanity. I don't think I've ever over-written anything longer than a blog post. And hey—flag football wasn't going to rhyme, and I had to do it. *hops in ridiculously late* I don't know how I missed this. Hehe, I have the exact opposite issue -- I keep feeling like my blog posts are too short and insubstantial. And, well, you have a point there. Rhyming rules. Hey, congrats on finishing Matroyshka. (More like !!!!!!!!!!!!!! !, honestly. Also BARBARA KIM HI HELLO.) I'm pretty sure you already know HOW DEEPLY I AM INVESTED IN THIS OMG. I've actually never heard of this super-sparse drafting technique, but it looks amazing and I want to try it with a future project. (Hmm, maybe the Red Riding Hood retelling. Or the Emperor's Nightingale retelling. 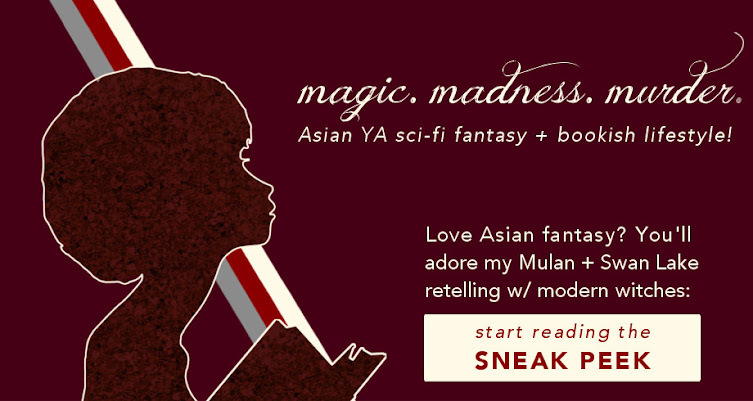 Or the roses + conquering + diversity high fantasy. SO MANY OPTIONS.) I've been working on OtMS for over two years now, and it does seem like I have a problem with finishing things. So many thanks for the tip! PS: I think I remember Alisaria from Shadowplay—remember LOVING her, to be more specific—so it's very cool that she pops up again! Thank you! (That is basically my reaction too, with more exhaustion. I'M SO EXCITED YOU'RE EXCITED SO LET'S JUST ALL BE EXCITED. PS: *coughcough* I actually sort of merged her with her brother Alyn, so she's somewhat less morbid now. Maybe. Hopefully you'll still like her! THANK YOU THANK YOU!!! I'm so happy it sounds interesting -- and yes, PLEASE, let dystopian come back. Wrapped as fantasy or scifi or whatever. And yes! In some ways this can be seen as a pantser's completely unplanned mess, or it could be a plotter's extremely detailed outline with many tentative elements. And argh, other drafts are making me so depressed right now. Thank you, Opal! :D Square brackets are particularly handy because I can just Ctrl+F for them in revisions and revise that particular bit. I used [transition] so many times in this draft! It's so smart of you to think of a writing process that fits with your thought process so well ;). Also congratulations for finishing Camp NaNo in such a short time! Thank you for your kind words, Melody! Sparse drafting sounds like such a neat idea--I'm super prone to getting bogged down in my first drafts, mostly by worrying about style and characterization and whether it's good enough--all things I'm not SUPPOSED to worry about in a first draft. 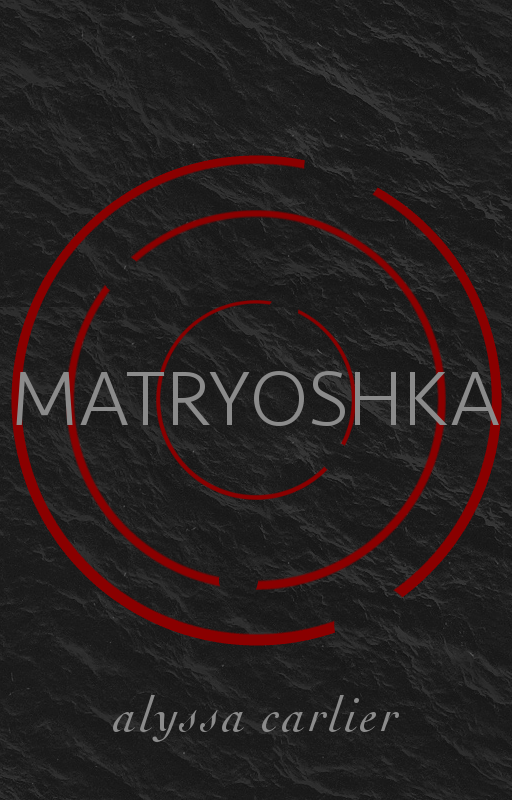 Thanks for sharing your process; Matryoshka sounds like a wonderful story, and I hope to hear more about it soon! If that's the case, I definitely recommend sparse drafting -- I hadn't realised how much time I spent agonising over minor things until I used this method and breezed through the novel. Thanks for dropping by! 14 days - now that's something. :') So it was Matryoshka that I got in my inbox? It's a lovely title for your novel, and I like the book cover as well! Sparse drafting sounds really good for people who focus on the forest instead of the trees. It's something I couldn't do as a perfectionist who has to get all the little details, but it's great that it worked for you! WOW congratulations!! That is so fabulous! And I have to say, I LOVE this whole idea- I was so focused on writing a WHOLE BOOK in 30 days when I tried NaNo that I think I was overwhelmed. This could be my solution- so thank you thank you thank you! I really want to try NaNo again, get my blog scheduled in advance, so I can really put some effort into it, and I seriously think your idea is absolute genius. Thank you, Shannon! And yeah, if you have lots of time it seems possible to write a whole novel, but really, it's all just word vomit to be revised later, so I figured I might cut down in the first draft. I really hope this drafting method works out for you! Hmm... this is an interesting idea that I'll have to attempt. It could go wonderfully right or horribly wrong, but I guess I don't know until I try right? Especially considering that I seem to have many of the same problems/processes as you... I'll have to remember this when I'm writing the first draft of my next novel! It's so awesome that you completed your first draft in fourteen days! I remember I wrote my first 20K of my second book in just seven days. I have never done anything CLOSE to that since *wistful sigh* I think it's because those boys were sitting in my head, waiting to get out, and they just kind of ... forced themselves onto the page. I like the idea of this sparse draft, though I could never do it myself. I'm much too attached to my prose as I'm writing things, and all my books (so far) are first person and quite emotional, too. So I wouldn't have much down in words, haha. I'm super happy that it's working for you, though! Good luck with fleshing this one out, Alyssa! That is more or less the same speed as I did -- and I was in the exact same situation for this ms! The idea was stewing for so long I had a lot of material in my head already. I *may* frame it as something else, because even though I can tick all the boxes of dystopian, the atmosphere and mood and style is quite different. And aww, thank you! That's the highest praise I could imagine.